Peonies (Paeonia species) are not highly susceptible to a large amount of pest infestations, but those that affect this perennial flowering plant can cause severe damage. For protection against pest invasion, maintain plants according to particular care requirements. 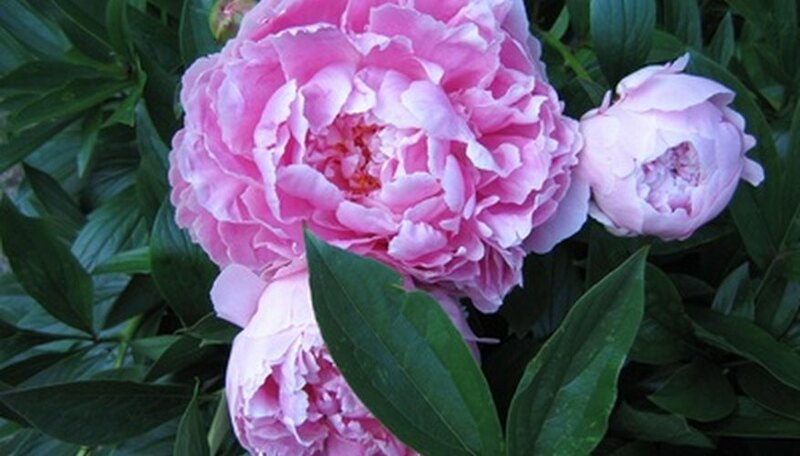 Keep peonies in full sun with afternoon shade in warmer regions and grow in moist, well-drained soil. Scale insects cause pest infestations on peony plants. Their appearance, particularly adult female scales, causes confusion because they are unmoving, lack wings and separate body parts. Peony plants are affected by armored scales, a type of scale from the Diaspididae family that have flat body coverage resembling plates or armor. Scale infestations cause disease when they insert their stabbing mouths into plant tissue, parasitically removing fluid. Though the presence of a few scales will not hurt a peony, a severe infestation may cause premature defoliation, wilted or yellowed leaves and curled leaves or discoloration, according to the University of California IPM Online. All parts of the peony plant are susceptible to damage. For control, consider use of beneficial enemies like lady beetles or parasitic wasps, which are other insects that attack the pests without further damaging the plant. Additionally, application of horticultural oil from late winter to the beginning of the summer season will control scales. Hoplia beetle (Hoplia callipyge) infestations of peony plants display oval-shaped adult beetles that measure 1/4 inch in length from March to May, according to the University of California IPM Online. Feeding on lighter-colored flowers, these brown beetle pests lay eggs in soil. The developed adult beetles seek out flower blossoms and eat round holes in plant petals as well as buds. For control of this disease, pick the beetles from flowers by hand and place them in soapy water for disposal. Additionally, consider removing the entire bloom head if infestation is severe. Spraying your peonies is not a recommended form of control. However, if the infestation is destroying your plants, apply the insecticide carbaryl or malathion only as a last effort; insecticides kill beetles at the time of application, but they also kill beneficial insects and honeybees. Thrips (Thysanoptera order) are thin, tiny insects that measure less than 1/20 inch long with fringed wings in a white, yellow, black or brown hue, according to the University of California IPM Online. Thrips generally feed in enclosed areas like buds, curled leaves or any other closed plant area. Black specks on petal surfaces are a sign of thrip pest disease. Spreading with great ease from plant to plant, thrips feed on tissue with a fast growth rate and leave small areas of scarred plant tissue that lead to stunted growth, leaf death or deformation, discoloring and defoliation. For control, always keep your peonies thriving with proper maintenance. Use predatory thrips and other natural enemies like minute pirate bugs for natural control. Look for these types of insects in garden catalogs. Remove and destroy affected plants and plant parts, prune infested plant areas without wounding the plant tissue and consider using reflective mulch to confuse insects. Reflective mulch is a metallic film that reflects UV lights. If biological and cultural controls are not effective, turn to chemical control. Though damage is generally cosmetic and chemicals are not necessary, application of neem oil, azadirachtin oil or insecticidal soaps will temporarily decrease thrip populations.